This calendar is exclusive of privately organized events. Join us for Vineyard Vibrations for FREE, live music by blues artist, Matt Woods! Sneakers Eatery and Pub will have food available for purchase. Matt Woods is both a native of Iowa, and a longstanding purveyor of its diverse blues scene. 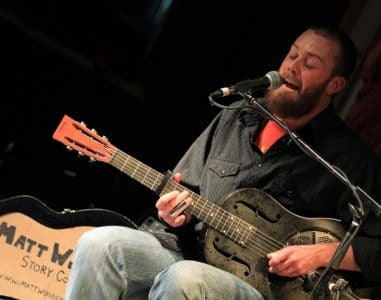 As a seasoned performer of many local, regional and national clubs and venues, Matt has developed a distinct style while staying true to his love of traditional American roots music. Woods is well-versed in the many shapes this music can take; from traditional delta, hill country and urban electric blues, to gospel, country and folk music. If you are a musician looking to perform at Soldier Creek Winery, please use the form on our contact page.